We work with industrial hygienists and indoor air quality environmentalists to ensure the job is done right the first time. With the proper testing and protocols every job can be a success. We use the most accurate and up to date moisture meter equipment to measure moisture in your wood floors, walls, ceilings, and cabinets. We then use infrared cameras to identify the origin and the extent of the damage. Mold growth can be controlled indoors by controlling moisture indoors. The EPA reports that Molds can be found almost anywhere; they can grow on virtually any organic substance, as long as moisture and oxygen are present. There are molds that can grow on wood, paper, carpet, foods, and insulation. 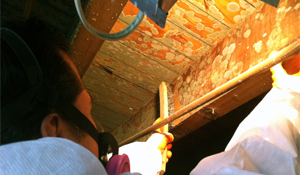 When excessive moisture accumulates in buildings or on building materials, mold growth will often occur, particularly if the moisture problem remains undiscovered or unaddressed. Molds are part of the natural environment, but they have the potential to cause health problems or exacerbate existing ones. According to the Environmental Protection Agency, molds produce allergens (substances that can cause allergic reactions), irritants, and in some cases, potentially toxic substances (mycotoxins). Inhaling or touching mold or mold spores can cause allergic reactions such as sneezing, runny nose, red eyes, and skin rash (dermatitis). Allergic reactions to mold are common. Health Effects and Symptoms Associated with Mold Exposure !!! When moisture problems occur and mold growth results, building occupants may begin to report odors and a variety of health problems, such as headaches, breathing difficulties, skin irritation, allergic reactions, and aggravation of asthma symptoms; all of these symptoms could potentially be associated with mold exposure. All molds have the potential to cause health effects. Molds produce allergens, irritants, and in some cases, toxins that may cause reactions in humans. The types and severity of symptoms depend, in part, on the types of mold present, the extent of an individual's exposure, the ages of the individuals, and their existing sensitivities or allergies. Some compounds produced by molds are volatile and are released directly into the air. These are known as microbial volatile organic compounds (MVOCs). Because these compounds often have strong and/or unpleasant odors, they can be the source of odors associated with molds. Exposure to (MVOCs) from molds has been linked to symptoms such as headaches, nasal irritation, dizziness, fatigue, and nausea. Research on MVOCs is still in the early phase. Glucans or Fungal Cell Wall Components (also known as ß-(1-->3)-D- Glucans) are small pieces of the cell walls of molds which may cause inflammatory lung and airway reactions. These Glucans can affect the immune system when inhaled. Exposure to very high levels of Glucans or dust mixtures including Glucans may cause a flu-like illness known as Organic Dust Toxic Syndrome (ODTS). This illness has been primarily noted in agricultural and manufacturing settings. Molds (and mildew) are fungi. Fungi are neither plant nor animal but, since 1969, have their own kingdom. The fungi kingdom includes such wonderful organisms as the delicious edible mushrooms, the makers of the "miracle drug" penicillin and the yeast that makes our bread rise and our fine wines ferment. Biologically, all fungi have defined cell walls, lack chlorophyll and reproduce by means of spores. Approximately 100,000 species of fungi have been described and it is estimated that there are at least that many waiting to be discovered. The vast majority of fungi feed on dead or decaying organic matter – they are one of the principle agents responsible for the natural recycling of dead plant and animal life. The most common fungi are ubiquitous within our environment and we are constantly exposed to them. For the most part, however, diseases caused by these common fungi are relatively uncommon and are rarely found in individuals with normally functioning immune systems. (1) Nonetheless, mold has recently experienced high profile press coverage. There are a variety of inflammatory press reports concerning lawsuits over air quality in homes, courthouses and other buildings; parental concerns regarding school classroom environments; home insurers refusing to cover mold damage; and widely distributed news reports on so-called "toxic mold." But don't panic. Mold can be managed effectively in most cases and this guide will help you do that. 1. Available mold spores ranging in size from 3 to 40 microns (human hair is 100-150 microns) are ubiquitous – they are literally everywhere. There is no reasonable, reliable and cost-effective means of eliminating them from environments that humans inhabit. So, trying to control mold growth through the elimination of mold spores is not feasible. 2. Mold Food. If all three other requirements are met, almost any substance that contains carbon atoms (organic substance) will provide sufficient nutrients to support mold growth. Even the oil from your skin that is left when you touch an otherwise unsuitable surface, like stainless steel, or the soap residue left from a good cleaning will provide sufficient nutrients to support the growth of some molds. And many of the most common materials found in homes like wood, paper and organic fibers are among the most preferred of mold nutrients. Thus, eliminating mold food from your environment is a virtually impossible task. 3. Appropriate Temperatures. Unfortunately, most molds grow very well at the same temperatures that humans prefer. In addition, anyone who has cleaned out their refrigerator quickly realizes that temperatures close to freezing are not cold enough to prevent mold growth and temperatures that are much warmer than humans prefer, like those of the tropics, will grow abundant quantities of mold. Therefore, it is not feasible to control mold growth in our home environment through the control of temperature. 4. Considerable Moisture. Most molds requires the presence of considerable moisture for growth. Obviously, the word "considerable" is key here. The mycologists (fungi scientists) refer to "water activity" when describing the required conditions for mold growth. The various species of mold have different water activity requirements. A material's "water activity" is equivalent to the relative humidity of the air that would be in equilibrium with the material at that material moisture content. The vast majority of mold species require "water activity" levels that are equivalent to material equilibrium moisture contents corresponding to relative humidities of at least 70%. In fact, the great majority of serious, large mold outbreaks inside buildings occur where porous, cellulose-type materials have literally been kept wet by liquid water or sustained condensation. Human beings prefer humidities that are below the critical relative humidity for mold growth. Thus, of the four basic requirements for mold growth, moisture availability is by far the easiest mold growth requirement to control in environments that humans like to inhabit. As you will see from the vast majority of the literature on mold control, the consensus regarding effective mold control strategies consists of the combination of reducing the availability of moisture and killing and removing active mold growth colonies. Common household molds have a characteristic "musty" or "earthy" smell, somewhat like the forest floor deep in the woods. Growing colonies of mold can also be visually observed in many cases. Most people are familiar with moldy bread or mold growth on cheese or other food products that have been kept too long, so the "green fuzzy" characteristic of most mold growth is familiar. And those who have lived in Florida have heard the expression "green shoe syndrome" which refers to the fact that mold is particularly fond of leather products left unused for periods of time in dark humid places. Although most active mold colonies appear greenish to black (typical of mold growing on bathroom tile grout) in color, the characteristics of mold colonies growing behind vinyl wall covering in buildings takes on very different characteristics. These mold outbreaks typically result in pinkish to yellowish staining of the wall covering. They are quite important because they indicate serious, detrimental moisture accumulations within the gypsum wallboard behind the wall covering that can not be removed by your air conditioning or dehumidification systems. Where these problems appear, they usually require the assistance of a professional equipped with pressure measurement and other diagnostic equipment to determine the source or sources of the moisture causing the problem. Small Leaks: Even small water leaks will cause mold problems. Rainwater leaks from improperly flashed windows, wall and roof penetrations and plumbing leaks should be promptly repaired. Periodically inspect under sinks and vanities for signs of water leakage. Use your nose and smell for "musty" or "earthy" odors – they usually indicate the presence of mold. Fix all water leaks promptly. Exterior Water Management: Redirect water away from the home's exterior — redirect sprinklers so that they don't spray on the walls. Do not landscape with hills that direct water flow towards the home. Use gutters. Keep down-spouts free of debris and direct outflow away from the home. Closets: Fungi like the dark and closets are rarely supplied with conditioned air as a standard part of air conditioning systems. As a result it is not all that uncommon to have mold or mildew occur in closets, especially on leather. Leaving the closet doors open to provide more conditioned air circulation or leaving the closet lights on with the door closed so as to raise the temperature (which lowers the RH) can reduce these problems. 911 Mold services will schedule a visit to your home or business to evaluate your mold concerns. If needed we will provide a list of third party hygienist companies for you to choose from to complete pre-testing of the property. Upon completion of the initial pre-testing the hygienist will provide a scope of work detailing steps to be taken to insure the mold is fully removed. Once the mold remediation is completed the hygienist will come back for post-testing clearance to make sure all work was done properly and air quality is returned to normal levels.